The 10¢ Type I strip offered here--the largest multiple of Scott 13--was found in 1941 in a group of six strips of five, $3 face value, cut from the same sheet and included in a letter mailed on May 30, 1857, from Sacramento to an eastern publisher to pay for a subscription. When the publisher received them, the stamps had become stuck down, so he wrote a note on the letter and returned it with the unusable stamps, asking the sender to replace them with currency. About 84 years after these events, the letter with the stamps still attached was found by Alexander D. Gage (1905-1986), of Pasadena, a stamp dealer and partner in Higgins & Gage. The stamps were plated by Stanley B. Ashbrook, and the discovery was reported in the 8/30/1941 Stamps magazine. 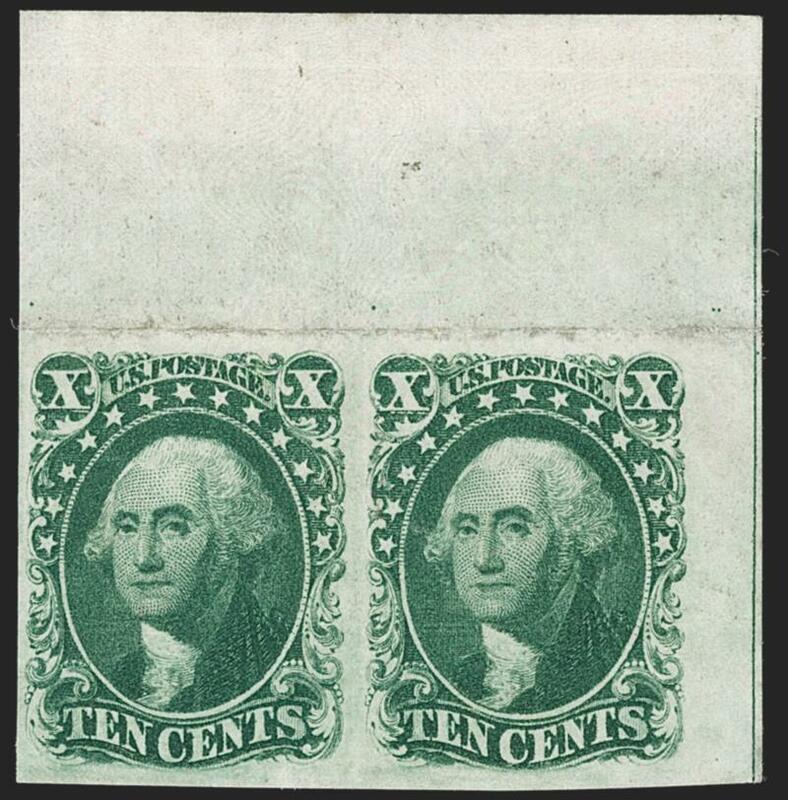 ANPHILEX 1971 "Aristocrats of Philately"
The 10¢ Green Imperforate was issued in mid-1855, the second denomination of its kind after the 1847 Issue. 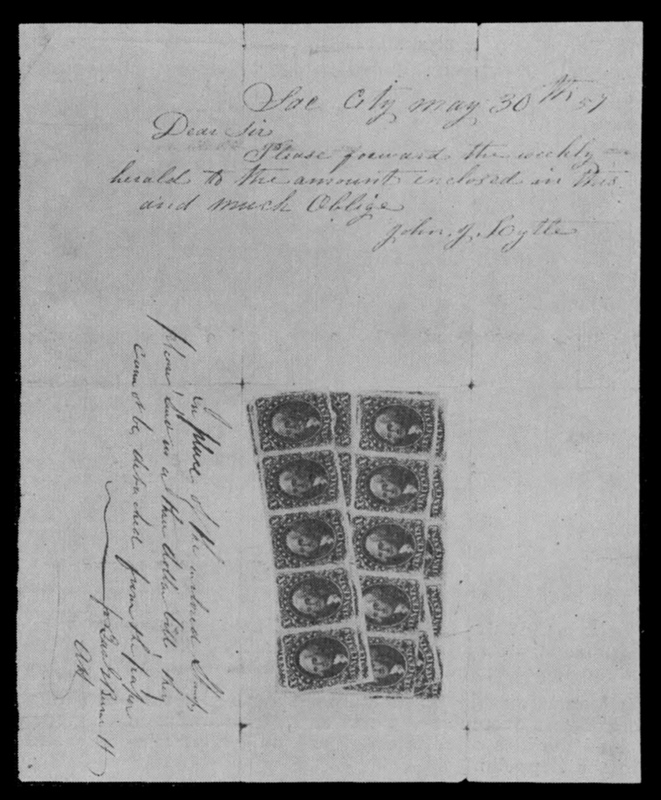 The need for 10¢ stamps was revived in 1855 when Congress created a new prepaid "over 3,000 miles" rate for letters to and from the West Coast. They also gave the postmaster general discretionary power to require prepayment by stamps. 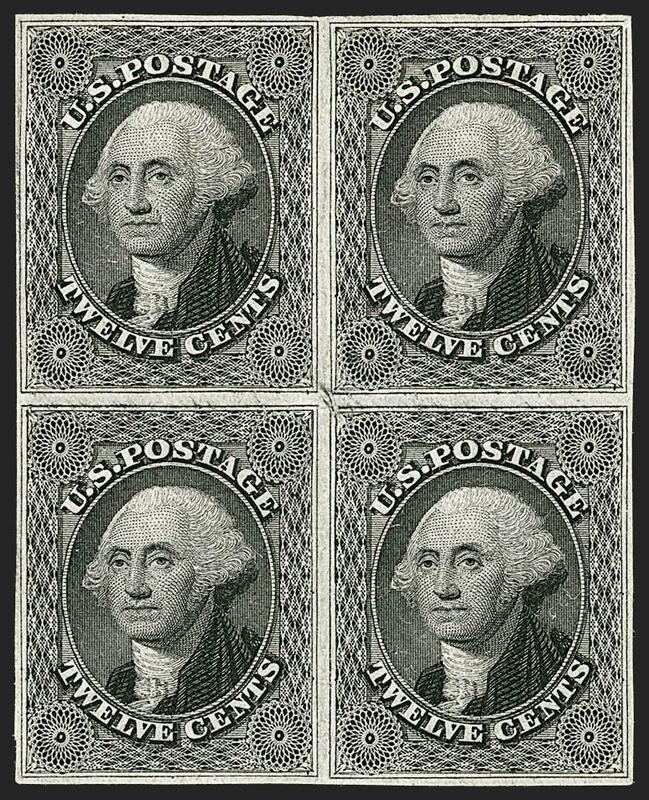 The 10¢ stamps were printed by Toppan, Carpenter, Casilear & Co. from steel plates of 200 subjects, divided into panes of 100. 10¢ Type IV stamps are defined by recut outer curved lines at the top or bottom of the design, or both in one position (64L). 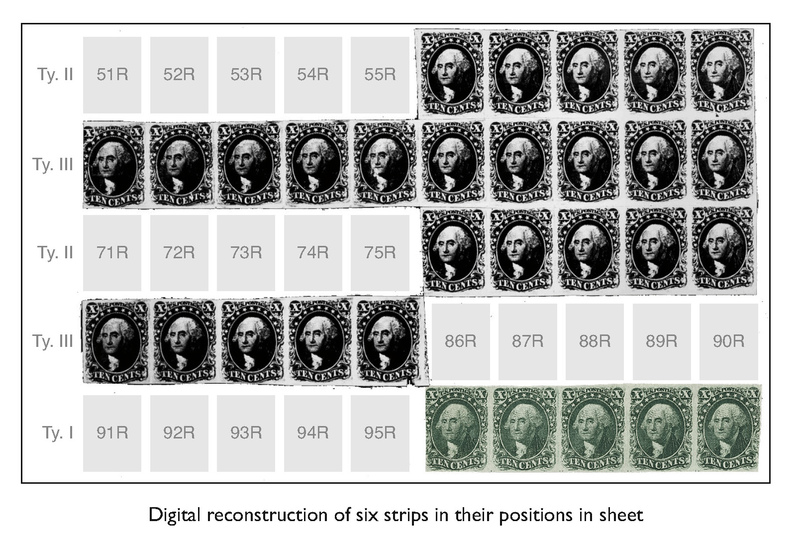 Recutting was done on only seven scattered positions in the left pane and one position in the right pane. 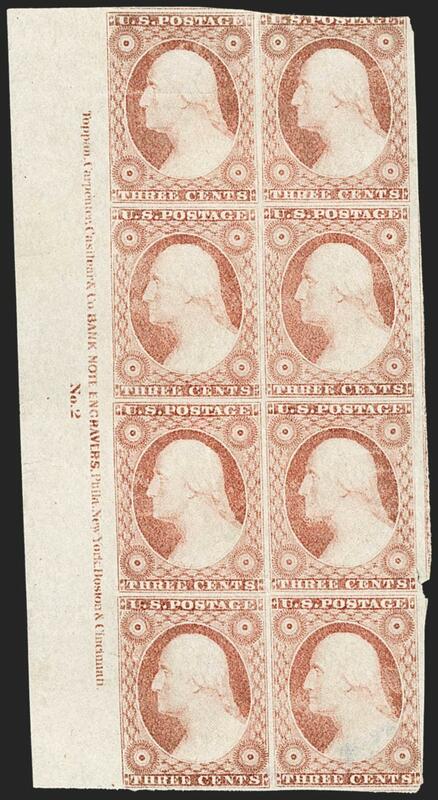 Therefore, only 4% of the stamps from Plate 1 are Type IV. 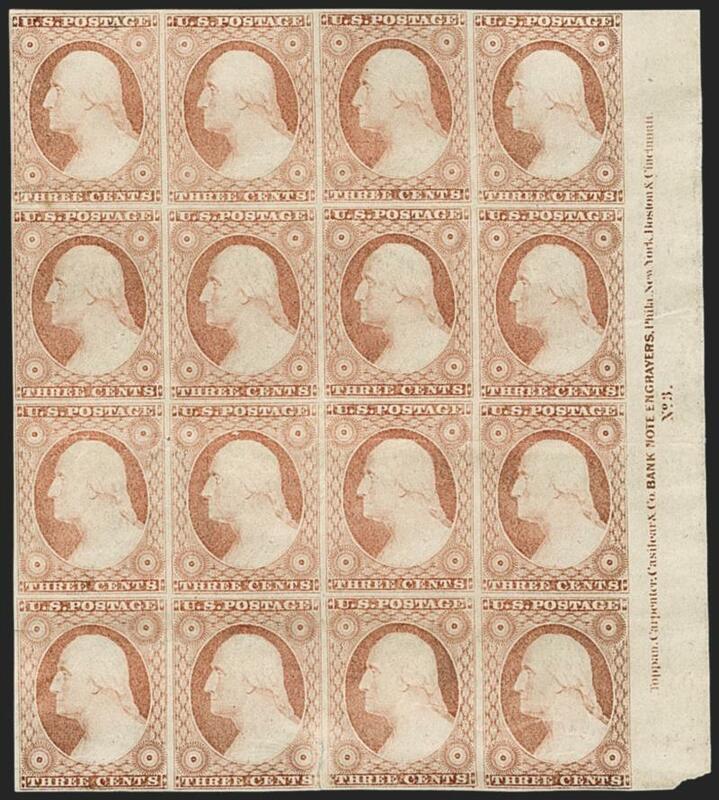 The strip of eight offered here, containing two Type IV positions with a recut line at top (74L) and at bottom (76L), is the largest unused multiple of the 10¢ 1855 Issue and the largest unused multiple with Type IV stamps. This strip was one of the featured items in the 1956 sale of the Alfred H. Caspary collection, where it sold to the Weills for $3,100. While many outstanding items bought by the Weills in the Caspary sales went directly to Bejamin D. Phillips, their closely guarded client, this strip is not listed in the Phillips inventory. However, after the Weills acquired the entire Phillips collection in 1968 for $4.07 million, they began consigning items to auctions. This strip appeared in the 1969 Rarities of the World sale, along with several other pieces from the Phillips collection, so perhaps it was part of the collection at one point, but not listed in the inventory.